If you’ve been in Portland over the last 5 years, then you have literally felt the thickening of our metro area. People moving in, prices going up, inevitably changing our demographic. And it’s not just here, all over the country we are seeing the change. The past decade has proven a large decline in the nuclear family, only to be succeeded by the single-person household. “A snapshot of diverse household percentages supports the assertion: single-parent families, 7 percent; nuclear families, 20 percent; adults sharing with other adults, 20 percent; couples, 25 percent; and single people living alone, 28 percent.” says Roger K Lewis, Professor of Architecture at the Univ. of Maryland. So how does a changing demographic such as this, translate in the housing market? “in the past, a typical two-bedroom condominium or rental apartment would have a master bedroom-bathroom “suite” and a much smaller, second bedroom for a child or guest. Today, demand is rising for units without bedroom hierarchy.” says Lewis. With these changes in mind, The National Building Museum in Washington, D.C. currently has an exhibition titled: Making Room: Housing for a Changing America which features Clei (aka Resource Furniture) wall bed products. Be sure to check out the exhibit here and if you’re ready to shop the products for yourself. 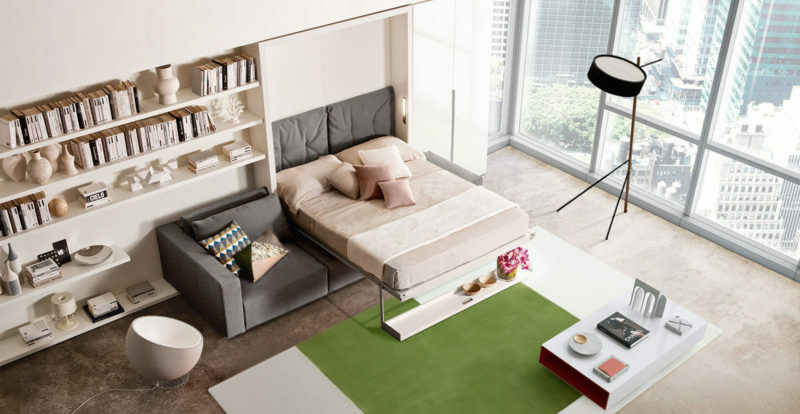 Come by Hip, and we’ll show you how this furniture can make your piece of the city, your home.